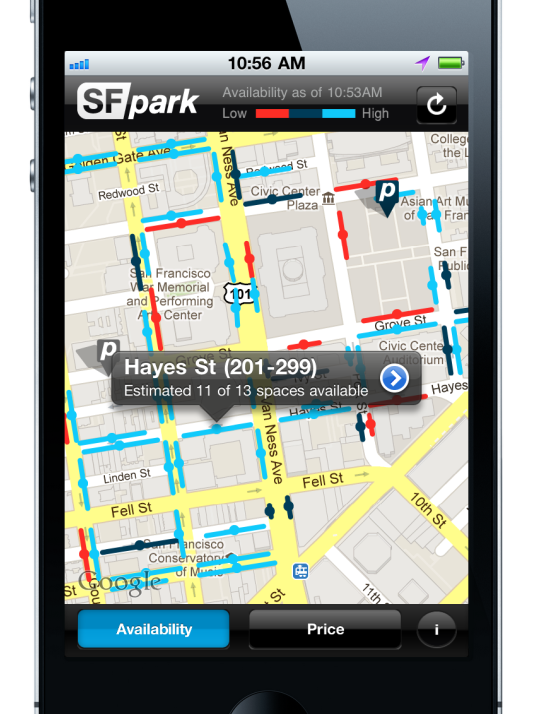 A screenshot of SFpark, an app that lets San Francisco drivers see available parking spaces as well as each space's cost. It's one of the great frustrations of urban life: the seemingly unending search for a parking space. Motorists drive themselves crazy circling the block looking for a place to park while wasting gas and polluting the air. But the city of San Francisco has turned to technology for help — it is testing a smartphone app that shows drivers the location of available parking places. The app also tells them how much the space will cost, and prices are adjusted depending on demand. Demetrius Martin, an actor and producer, recalls the stress of looking for work in San Francisco. "I had to learn the city under the duress of making it to an audition on time," he says. "You're probably going to have to park illegally and end up getting a ticket. That will be your fee for the day." Martin is in his car, holding an iPhone, and launching a new app offered by the city. It gives a driver real-time information, on a block-by-block basis, about exactly where and when there are parking spaces available. Red dots show there is extremely low availability, and blocks marked in sky blue or darker blue mean there's higher availability. Sensors installed at more than 8,000 parking metered spaces and more than 12,000 spaces in city-owned garages allow the application to update itself every 60 seconds. "I like that they have price and availability because that's — in any metro area — that's another challenge you have to consider," he says. "The prices per 20 minutes, let alone per hour are so high that you kind of lose your shirt." San Francisco is by far the most sophisticated and the highest-tech experiment with this, and I think if this works out in San Francisco — with their adjustable prices — that every city on earth with be copying it. Under this new system, parking meter prices are adjusted higher in areas with high demand. The idea is that higher prices will discourage drivers and push them to blocks where space is available. For now, rates can be changed only once a month. This pricing structure and the parking app are part of a pilot project called SFpark, which is funded through a $19.8 million federal grant from the Department of Transportation. "One of the most exciting things about this project is that it's going to create an unprecedented data set — bringing together data from parking meters, parking sensors, citations, transit vehicles, sales tax," says Jay Primus, the manager of SFpark. "And truly a case where technology is allowing us to be much smarter about how we manage parking." So far about 25,000 people have downloaded the parking app. Other cities, including Los Angeles and Fort Worth, have also introduced smartphone parking apps. Seattle is experimenting with demand-based parking prices. But San Francisco has the most comprehensive approach, says Donald Shoup, who teaches urban planning at UCLA. "San Francisco is by far the most sophisticated and the highest-tech experiment with this, and I think if this works out in San Francisco — with their adjustable prices — that every city on earth with be copying it," he says. Sensors installed in city-owned garages and on-street parking track when and where parking is available. Sensor data are uploaded wirelessly to the SFpark data feed, which allows the public to view available spaces via the website and smartphones. SFpark will adjust meter prices based on demand to encourage drivers to make trips in off-peak hours and to use parking lots and garages. While the price of high-demand spaces will gradually increase, the price of other spaces will decrease. Longer time limits and new meters that accept credit and debit cards will make it easier to avoid parking tickets. But before that happens, people will be watching to see how much of a distraction the smartphone app is to drivers who are supposed to keep their eyes on the road. Martin confesses that problem is real. "So here we are, I am trying to avoid looking at it but every time you're at a pause or a stop you're looking at this trying to find where the next parking space is," he says. "It's hard to not want to keep looking at it, and with some people it's a challenge, it's an ego challenge, and it's a game, you know." City officials are trying to downplay that risk. They say they always encourage drivers to look at the app before they start driving.